Broadside tells the story of a newly restored English monarch, Charles II, leading his country into the fiercest trade war in the age of sail. The story shows the inner workings of Charles' court, including the influence of Lady Castlemaine, and the management of his navy and his war. Unfortunately for Charles, his Dutch adversary is Johann de Witt, a bold and able leader, whose untiring efforts saved the young Dutch republic from a war it could not win and prepared for a war it could. Viewers will witness De Witt coolly keeping one step ahead of both his Dutch political opponents and Charles' advisors. Viewers will also meet the greatest admirals of that century, some say any century, De Ruyter, Monck, Tromp, James, Evertsen, and Holmes. They will witness two hundred Dutch and English battleships, in miles-long formations, fighting desperately and violently over who will dominate world trade for the next two hundred years. Broadside tells its story with a drama possible only with an ensemble of great actors. 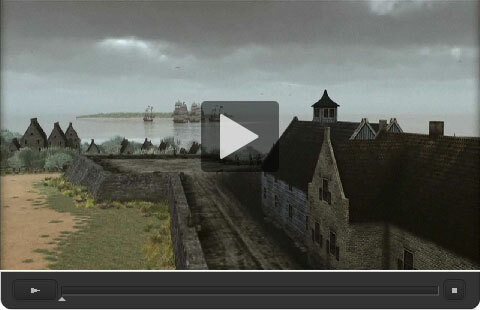 3D animation brings to life colonial New York; Restoration London with plague and The Fire; the fleets; and, the battles by land and sea. Drama plus animation plus experts provide in-depth narrative, breathtaking panoramas, and emotional connection to the life and times of the 17th century.